Slated for a July release in the UK, the Motorola Wilder promises to be a smart-dumb phone aimed at an active lifestyle. The newly announced Wilder is designed to bring all the basic functionality from your average smartphone in a tiny package with a rugged exterior. Not all the specs are available yet but we know it's going to be a compact device with a capacity of just 88 cubic centimeters and a low weight of just 92 grams. A rubberized outer casing helps give the Wilder its splash and dust resistive attributes but you can still interact with it on the 2.8" TFT resistive touchscreen (with a resolution of 240x360 pixels). Sitting just below the main display, is a secondary OLED 0.7" screen for notifications, a nice touch and something seldom seen since the days of the flip phone. Being a feature phone, connectivity is limited, but the Wilder does come with Bluetooth 2.1, a 3.5mm headphone jack and has a physical microUSB (v2.0) port on the left side of the device covered by a rubberized tab. It also comes with a 2MP camera on the back that can shoot video at 15fps and an FM radio. We're not sure exactly what UI the Wilder will run, since Motorola doesn't have a feature phone UI in place on current phones - especially a touch one. Anyway, software-wise the Wilder will have pre-installed Opera Mini for web browsing, social networking integration with Facebook, Myspace, Twitter and YouTube, embedded games including Tetris and Need for Speed and 5MB of internal storage with a microSD slot that can take anything up to 32GBs. 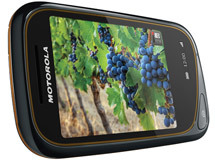 The Motorola Wilder is expected to come to Carphone Warehouse in the UK from July and will cost around £49.95.